Promotional Silly Bandz / Rubber Bandz In Custom Printed Containers! 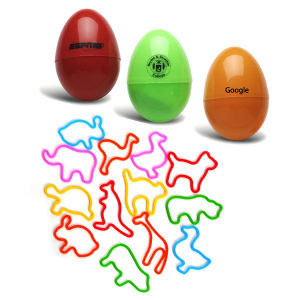 If you are looking for a promotional product that ties in with a hot craze you might be interested in the shaped rubber bands (often referred to as "Silly Bandz" or "Rubber Bandz"). They come twelve per egg shaped container with your logo printed on the egg shaped case. The eggs come in blue, green, red and yellow. (Other colors are available with 1000 piece minimums) and the shaped rubber band sets include dental, farm animals, dinosaurs, fruit, insects, music, sea animals, transportation, Christmas, and Halloween glow. If you are looking for custom printed promotional products that are on sale we've added featured products in three more categories to the site today. In the health and safety promotional products section we have great deals on customized first aid travel kits, flashlights, and pill boxes. In the customized school giveaway items area we added specials on pencils, rulers, drawstring backpacks and pencil pouches. And if you're looking for promotional clocks and watches that can be printed with your logo check out our specials on wall clocks, desk and mantel clocks, and watches. There is also a neat calculator that has a clock and picture frame built right in and a nice customized travel clock and luggage tag gift set. When our clients order custom printed promotional products from us we are always happy to provide basic artwork services at no charge. This can include various graphic elements and text layout including a company name and contact information. Designing artwork to be printed on a promotional product is generally looked at very differently than creating a logo for a company. The file will most likely be a .ai, .eps, or .pdf file. (Not all ai, eps, or pdf files will contain vector art but a jpg, tif, or gif will definately not be vector based.) If it is an ai or eps file you may not be able to open it unless you have specific programs. Getting the proper files when you have your logo created will keep you from needing to have the logo recreated or having to track your artist down and asking them to send you a vector version when you are ready to put print your logo on promotional items.